Do you like mushrooms? Well, it’s peak morel season now, my friends, and that means ridiculously low prices from the mushroom guy in Vancouver’s Granville Island Market. You could drive into the wilderness, and risk life and limb clambering about on vertiginous slopes among the ruins of one of last year’s forest fires for these little bundles of umami-laden pure joy that evolved from yeast about fifty thousand years ago….but why? They’re twelve dollars a pound, for pete’s sake! Do not hesitate. Go to the Market, buy them, go home directly and sautee them whole with some butter, hit the pan with some chicken stock when you flip ’em. Then when the pan starts to go dry, deglaze with Marsala and mount sauce with a couple more knobs of butter, season to taste and you’re there. 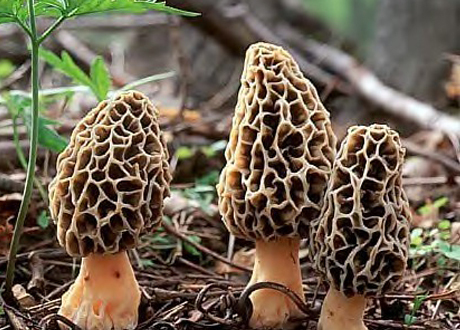 Couldn’t have said it better myself, absolutely delicious, it’s a relief to hear that there are other people who actually know what morels are. Very good pan fried. As a kid in Indiana I saw people bring bring in them in by the bushel. People will buy these delicious mushrooms for up to $15 lb. I am 51 yrs old and have been hunting them yearly for approx. 40yrs. I call them the mysterious mushroom. Seems as though one year you might find them near a certain type of tree or bush and the next year maybe a different type of tree or bush. You can ask 10 different iowans when, where or how and get 10 different answers.I choose to give my extras to the disabled or elderly who cannot get out to find them. I am waiting for spring to go hunting again. I love those morrels!!!!!! !